The Burning of Washington was a British invasion of Washington, D.C., the capital of the United States, during the Battle of Bladensburg in the War of 1812. On August 24, 1814, after defeating the Americans at the Battle of Bladensburg, a British force led by Major General Robert Ross burned down multiple buildings, including the White House (then called the Presidential Mansion), the Capitol building, as well as other facilities of the U.S. government. The attack was in part a retaliation for the recent American destruction of Port Dover in Upper Canada. The Burning of Washington marks the only time since the American Revolutionary War that a foreign power has captured and occupied the United States capital. Many government buildings set ablaze. *Destruction of the 36-gun frigate USS New York. *44-gun frigate USS Columbia and 22-gun sloop USS Argus burnt to avoid capture. President James Madison, military officials, and his government fled the city in the wake of the British victory at the Battle of Bladensburg. They eventually found refuge for the night in Brookeville, a small town in Montgomery County, Maryland, which is known today as the "United States Capital for a Day". President Madison spent the night in the house of Caleb Bentley, a Quaker who lived and worked in Brookeville. Bentley's house, known today as the Madison House, still stands in Brookeville. Less than a day after the attack began, a sudden, very heavy thunderstorm—possibly a hurricane—put out the fires. It also spun off a tornado that passed through the center of the capital, setting down on Constitution Avenue and lifting two cannons before dropping them several yards away, killing British troops and American civilians alike. Following the storm, the British returned to their ships, many of which were badly damaged. The occupation of Washington lasted only about 26 hours and is debated whether the British merely sought to raze the city. After "The Storm that Saved Washington", as it soon came to be called, which ironically served to do more damage to the city, the Americans returned. The British government, already at war with Napoleonic France, adopted a defensive strategy against the United States when the Americans declared war in 1812. Reinforcements were held back from Canada and reliance was instead made on local militias and native allies to bolster the British Army in Canada. However, after the defeat and exile of Napoleon Bonaparte in April 1814, Britain was able to use its now available troops and ships to prosecute its war with the United States. In addition to reinforcements sent to Canada, the Earl of Bathurst, Secretary of State for War and the Colonies, dispatched an army brigade and additional naval vessels to Bermuda, from where a blockade of the US coast and even the occupation of some coastal islands had been overseen throughout the war. It was decided to use these forces in raids along the Atlantic seaboard to draw American forces away from Canada. The commanders were under strict orders, however, not to carry out operations far inland, or to attempt to hold territory. Early in 1814, Vice Admiral Sir Alexander Cochrane had been appointed Commander-in-Chief of the Royal Navy's North America and West Indies Station, controlling naval forces based at the new Bermuda dockyard and the Halifax Naval Yard which were used to blockade US Atlantic ports throughout the war. He planned to carry the war into the United States by attacks in Virginia and against New Orleans. Rear Admiral George Cockburn had commanded the squadron in Chesapeake Bay since the previous year. On June 25, he wrote to Cochrane stressing that the defenses there were weak, and he felt that several major cities were vulnerable to attack. Cochrane suggested attacking Baltimore, Washington, and Philadelphia. On July 17, Cockburn recommended Washington as the target, because of the comparative ease of attacking the national capital and "the greater political effect likely to result". General Ross commanded a 4,500-man army, composed of the 4th (King's Own) Light, 21st Royal North British Fusiliers, 44th (East Essex) Regiment of Foot, and 85th Regiment of Foot. ... in consequence of the late disgraceful conduct of the American troops in the wanton destruction of private property on the north shores of Lake Erie, in order that if the war with the United States continues you may, should you judge it advisable, assist in inflicting that measure of retaliation which shall deter the enemy from a repetition of similar outrages. On July 18, Cochrane ordered Cockburn to "deter the enemy from a repetition of similar outrages ... You are hereby required and directed to destroy and lay waste such towns and districts as you may find assailable". Cochrane instructed, "You will spare merely the lives of the unarmed inhabitants of the United States". Ross and Cockburn surveyed the torching of the President's Mansion, during which time a great storm arose unexpectedly out of the southeast. They were confronted a number of times while on horseback by older women from around Washington City and elderly clergymen (Southern Presbyterian and Southern Baptist), with women and children who had been hiding in homes and churches. They requested protection from abuse and robbery by enlisted personnel from the British Expeditionary Forces whom they accused of having tried to ransack private homes and other buildings. Major-General Ross had two British soldiers put in chains for violation of his general order. Throughout the events of that day, a severe storm blew into the city, worsening on the night of August 24, 1814. President James Madison, members of his government, and the military fled the city in the wake of the British victory at the Battle of Bladensburg. They eventually found refuge for the night in Brookeville, a small town in Montgomery County, Maryland, which is known today as the "United States' Capital for a Day." President Madison spent the night in the house of Caleb Bentley, a Quaker who lived and worked in Brookeville. 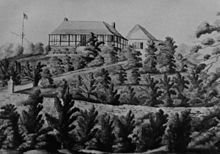 Bentley's house, known today as the Madison House, still stands in Brookeville. The Capitol was, according to some contemporary travelers, the only building in Washington "worthy to be noticed." Thus, it was a prime target for the British invaders, both for its aesthetic and symbolic value. Upon arrival into the city via Maryland Avenue, the British targeted the Capitol (first the southern wing, containing the House of Representatives, then the northern wing, containing the Senate). Prior to setting it aflame, the British looted the building (which at that time housed Congress, the Library of Congress, and the Supreme Court). Items looted by British General Sir George Cockburn included "An account of the receipts and expenditures of the United States for the year 1810." The British intended to burn the building to the ground. They set fire to the southern wing first. The flames grew so quickly that the British were prevented from collecting enough wood to burn the stone walls completely. However, the Library of Congress's contents in the northern wing contributed to the flames on that side. Among the items destroyed was the 3,000-volume collection of the Library of Congress  and the intricate decorations of the neoclassical columns, pediments, and sculptures. Later, though, former president Thomas Jefferson donated his personal book collection to start a new Library of Congress, originally designed by William Thornton in 1793 and Benjamin Latrobe in 1803. The wooden ceilings and floors burned, and the glass skylights melted because of the intense heat. But, the building was not a complete loss. The House rotunda, the east lobby, the staircases, and Latrobe's famous Corn-Cob Columns in the Senate entrance hall all survived. The Superintendent of the Public Buildings of the City of Washington, Thomas Munroe, concluded that the loss to the Capitol amounted to $787,163.28, with $457,388.36 for the North wing and main building, and $329,774.92 for the South wing. It has often been stated in print, that when Mrs. Madison escaped from the White House, she cut out from the frame the large portrait of Washington (now in one of the parlors there), and carried it off. She had no time for doing it. It would have required a ladder to get it down. All she carried off was the silver in her reticule, as the British were thought to be but a few squares off, and were expected any moment. John Susé (Jean Pierre Sioussat, the French door-keeper, and still living at the time of Jennings's memoir, and Magraw [McGraw], the President's gardener, took it down and sent it off on a wagon, with some large silver urns and such other valuables as could be hastily got hold of. When the British did arrive, they ate up the very dinner, and drank the wines, &c., that I had prepared for the President's party. The soldiers burned the president's house, and fuel was added to the fires that night to ensure they would continue burning into the next day. In 2009, President Barack Obama held a ceremony at the White House to honor Jennings as a representative of his contributions to saving the Gilbert Stuart painting and other valuables. (The painting that was saved was a copy Stuart made of the painting, not the original, although it is the same one on display in the East Room.) "A dozen descendants of Jennings came to Washington, to visit the White House. They looked at the painting their relative helped save." In an interview with National Public Radio, Jennings' great-great-grandson Hugh Alexander said, "We were able to take a family portrait in front of the painting, which was for me one of the high points." He confirmed that Jennings later purchased his freedom from the widowed Dolley Madison. Portrait of Admiral Cockburn at the National Maritime Museum in Greenwich, with Washington burning in the background. The U.S. Capitol and Treasury Building are at far right. The day after the destruction of the White House, Rear Admiral Cockburn entered the building of the D.C. newspaper, the National Intelligencer, intending to burn it down. However, several women persuaded him not to because they were afraid the fire would spread to their neighboring houses. Cockburn wanted to destroy the newspaper because its reporters had written so negatively about him, branding him "The Ruffian". Instead, he ordered his troops to tear the building down brick by brick, and ordered all the "C" type destroyed "so that the rascals can have no further means of abusing my name". The British sought out the United States Treasury in hopes of finding money or items of worth, but they found only old records. They burned the United States Treasury and other public buildings. The United States Department of War building was also burned. However, the War and State Department files had been removed, so the books and records had been saved; the only records of the War Department lost were recommendations of appointments for the Army and letters received from seven years earlier. The First U.S. Patent Office Building was saved by the efforts of William Thornton, the former Architect of the Capitol and then the Superintendent of Patents, who gained British cooperation to preserve it. [A] "When the smoke cleared from the dreadful attack, the Patent Office was the only Government building ... left untouched" in Washington. The Americans had already burned much of the historic Washington Navy Yard, founded by Thomas Jefferson, to prevent capture of stores and ammunition, as well as the 44-gun frigate USS Columbia and the 22 gun USS Argus both new vessels nearing completion. The Navy Yard's Latrobe Gate, Quarters A, and Quarters B were the only buildings to escape destruction. Also spared were the Marine Barracks and Commandant's House, although several private properties were damaged or destroyed. In the afternoon of August 25, General Ross sent two hundred men to secure a fort on Greenleaf's Point. The fort, later known as Fort McNair, had already been destroyed by the Americans, but 150 barrels of gunpowder remained. While the British were trying to destroy it by dropping the barrels into a well, the powder ignited. As many as thirty men were killed in the explosion, and many others were maimed. Less than a day after the attack began, a sudden, very heavy thunderstorm—possibly a hurricane—put out the fires. It also spun off a tornado that passed through the center of the capital, setting down on Constitution Avenue and lifting two cannons before dropping them several yards away and killing British troops and American civilians alike. Following the storm, the British troops returned to their ships, many of which were badly damaged. There is some debate regarding the effect of this storm on the occupation. While some assert that the storm forced their retreat, it seems likely from their destructive and arsonous actions before the storm, and their written orders from Cochrane to "destroy and lay waste", that their intention was merely to raze the city, rather than occupy it for an extended period. Whatever the case, the British occupation of Washington lasted only about 26 hours. Despite this, the "Storm that saved Washington", as it became known, did the opposite according to some. The rains sizzled and cracked the already charred walls of the White House and ripped away at structures the British had no plans to destroy (such as the Patent Office). The storm may have exacerbated an already dire situation for Washington DC. An encounter was noted between Sir George Cockburn 10th Baronet and a female resident of Washington. "Dear God! Is this the weather to which you are accustomed to in this infernal country?" enquired the Admiral. "This is a special interposition of Providence to drive our enemies from our city", the woman allegedly called out to Cockburn. "Not so, Madam", Cockburn retorted. "It is rather to aid your enemies in the destruction of your city", before riding off on horseback. Yet, the British left right after the storm completely unopposed by any American military forces. The Royal Navy reported that it lost one man killed and six wounded in the attack, of whom the fatality and three of the wounded were from the Corps of Colonial Marines. A separate British force captured Alexandria, on the south side of the Potomac River, while Ross's troops were leaving Washington. The mayor of Alexandria made a deal and the British refrained from burning the town. President Madison returned to Washington by September 1, on which date he issued a proclamation calling on citizens to defend the District of Columbia. Congress returned and assembled in special session on September 19. Due to the destruction of the Capitol and other public buildings, they initially met in the Post and Patent Office building. In 2013, an episode of the Weather Channel documentary series When Weather Changed History, entitled "The Thunderstorm That Saved D.C.", was devoted to these events. Most contemporary American observers, including newspapers representing anti-war Federalists, condemned the destruction of the public buildings as needless vandalism. Many in the British public were shocked by the burning of the Capitol and other buildings at Washington; such actions were denounced by most leaders of continental Europe, where capital cities had been repeatedly occupied in the course of the French Revolutionary and Napoleonic Wars but always spared destruction (at least on the part of the occupiers – the famous burning of Moscow that occurred less than two years prior had been an act carried out by the defenders). According to The Annual Register, the burning had "brought a heavy censure on the British character", with some members of Parliament, including the anti-establishment MP Samuel Whitbread, joining in the criticism. 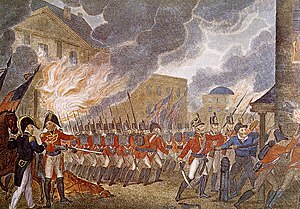 The majority of British opinion believed that the burnings were justified following the damage that United States forces had done with its incursions into Canada. In addition, they noted that the United States had been the aggressor, declaring war and initiating it. Several commentators regarded the damages as just revenge for the American destruction of the Parliament buildings and other public buildings in York, the provincial capital of Upper Canada, early in 1813. Sir George Prévost wrote that "as a just retribution, the proud capital at Washington has experienced a similar fate". The Reverend John Strachan, who as Rector of York had witnessed the American acts there, wrote to Thomas Jefferson that the damage to Washington "was a small retaliation after redress had been refused for burnings and depredations, not only of public but private property, committed by them in Canada". When they ultimately returned to Bermuda, the British forces took two pairs of portraits of King George III and his wife, Queen Charlotte, which had been discovered in one of the public buildings. One pair currently hangs in the House of Assembly of the Parliament of Bermuda, and the other in the Cabinet Building, both in the city of Hamilton. 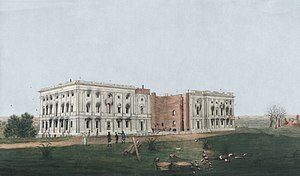 Although the President and military officers returned to Washington only a few days after the British left, Congress did not return for three and half weeks. The Thirteenth Congress officially convened on September 19, 1814, at the Blodgett's Hotel, one of the few surviving buildings large enough to hold all members. The Blodgett's Hotel also housed the U. S. Patent Office. Although the British had destroyed all public buildings, the Blodgett's Hotel and U.S. Patent Office was spared. It was in this building that Congress met between September 1814 and December 1815 (when construction of the Old Brick Capitol was complete). There was a movement in Congress to relocate the capital after the burning. Congressmen from the North pushed for relocation to Philadelphia or other prominent northern cities, while Southern congressmen claimed that moving the capital would degrade the American sense of dignity and strength (however, many southern congressmen simply did not want to move the capital north of the Mason–Dixon line). On September 21, 1814, the House of Representatives voted to strike down a proposal to relocate the capital from Washington, D.C. by a margin of 83 to 54. On February 3, 1815, in an effort to guarantee that the federal government would always remain in the area, Washington property owners funded the building of the Old Brick Capitol, a larger meeting space where the Supreme Court now stands. Construction of the Old Brick Capitol cost $25,000 and was funded primarily through the sale of stocks. The largest donor was Daniel Carroll of Duddington, a rich English property owner in the area. Construction began on July 4, 1814, and concluded in December 1815. Congress met in the Old Brick Capitol between December 1815 and December 1819, when the Capitol reopened. The Capitol reconstruction took much longer than anticipated. The Old Brick Capitol took only five months to complete; the Capitol took twelve years. A committee appointed by Congress to investigate the damage to the District concluded that it was cheaper to rebuild the already existing and damaged buildings than to build an entirely new one. On February 13, 1815, President Madison and Congress passed legislation to borrow $500,000 to repair the public buildings, including the Capitol, "on their present sites in the city of Washington". Benjamin Latrobe, architect of the Capitol who took over for William Thornton in 1803, was rehired to repair the building on April 18, 1815. He immediately requested 60,000 feet of boards, 500 tons of stone, 1,000 barrels of lime, and brick. With the $500,000 borrowed from Washington banks, Latrobe was able to rebuild the two wings and the central dome before being fired in 1818 for being difficult. Charles Bulfinch took over and officially completed the renovations by 1826. Bulfinch modified Latrobe's design by increasing the height of the Capitol dome to match the diameter of 86 ft. With the reconstruction of the public buildings in Washington, the value of land in the area increased dramatically, paving the way for the expansion of the city that developed in the years leading up to the American Civil War. ^ Brief History of the United States Patent Office from its foundation—1790 to 1886—with an outline of laws, growth, publications, office routine, etc. Washington, D.C.: R. Beresford, Printer. 1886. Archived from the original on April 15, 2012. Retrieved December 16, 2011. It is written that a loaded cannon was aimed at the Patent Office to destroy it. Thornton "put himself before the gun, and in a frenzy of excitement exclaimed: 'Are you Englishmen or only Goths and Vandals? This is the Patent Office, a depository of the ingenuity of the American nation, in which the whole civilized world is interested. Would you destroy it? If so, fire away, and let the charge pass through my body.' The effect is said to have been magical upon the soldiers, and to have saved the Patent Office from destruction." ^ "Burning of Washington, D.C.;Chesapeake Campaign". The War of 1812. genealogy, Inc. Retrieved August 24, 2010. ^ "The tornado that stopped the burning of Washington - National Constitution Center". National Constitution Center. August 25, 2015. Retrieved October 11, 2018. ^ "The White House at War: The White House Burns: The War of 1812". White House Historical Association. Retrieved June 9, 2011. ^ Hitsman & Graves 1999, p. 240. ^ Morriss 1997, p. 98. ^ Morriss 1997, p. 100. ^ Morriss 1997, p. 101. ^ a b Cruikshank 2006, p. 402. ^ Cruikshank 2006, p. 414. ^ "Brookeville 1814". Maryland State Archives. Retrieved November 12, 2013. ^ a b Porter, Maj Gen Whitworth (1889). History of the Corps of Royal Engineers Vol I. Chatham: The Institution of Royal Engineers. ^ Herrick 2005, p. 92. ^ Muller, Charles, G. (1963). The Darkest Day: The Washington-Baltimore Campaign During the War of 1812. Philadelphia, PA: University of Pennsylvania Press. p. 139. ^ United States Department of the Treasury. "An account of the receipts and expenditures of the United States for the year 1810". Library of Congress. ^ Allen, William C. (2001). “Destruction and Restoration, 1814-1817” in History of the United States Capitol: A Chronicle of Design, Construction, and Politics. Washington, DC: United States Government Publishing Office. p. 98. ^ a b Herrick 2005, p. 99. ^ Muller, Charles G. (1963). The Darkest Day: The Washington-Baltimore Campaign During the War of 1812. Philadelphia, PA: University of Pennsylvania Press. p. 140. ^ a b c "History of the U.S. Capitol Building". Architect of the Capitol | United States Capitol. ^ United States Congress, Thirteenth Congress (October 29, 1814). "Report from the superintendent of the Public Buildings" in the Report of the Committee appointed to ... inquire into the cause ... of the invasion of the city of Washington by the British forces. Washington, DC: United States Congress. p. 362. ^ Pitch, Anthony S. (1998). The Burning of Washington: The British Invasion of 1814. Annapolis, Maryland: Naval Institute Press. pp. 49–50. ^ a b Jennings 1865, pp. 14–15. ^ Sioussat was the first Master of Ceremonies of the White House (McCormick 1904, p. 170). ^ Fredriksen 2001, p. 116. ^ "The Patent Fire of 1836". patentlaws.com. Retrieved December 14, 2011. ^ "One Hot Commodity: Great Patent Fire of 1836 United States Patent Office". Kids pages. United States Patent and Trademark Office. Retrieved December 16, 2011. ^ Roosevelt 1902, p. 47. ^ George 2000, p. 111. ^ "No. 16939". The London Gazette. September 27, 1814. pp. 1942–1943. ^ Landry 2009, p. 255. ^ "James Madison, Proclamation – Calling All Citizens to Unite in Defense of the District of Columbia September 1, 1814". The American Presidency Project. ^ Howe, David Walker (2007). What Hath God Wrought: The Transformation of America, 1815–1848. Oxford and New York: Oxford University Press. p. 67. ^ a b Hitsman & Graves 1999, pp. 243–244. ^ Hickey 1989, p. 202. ^ Elting 1995, p. 220. ^ Hitsman & Graves 1999, pp. 244–245. ^ Allen, William C. (2001). "Destruction and Restoration, 1814–1817". History of the United States Capitol: A Chronicle of Design, Construction, and Politics. Washington, DC: United States Government Publishing Office. p. 99. ^ Skeen, C. Edward (2003). "The Fourteenth Congress Begins". 1816: America Rising. University Press of Kentucky. p. 35. JSTOR j.ctt130jf4x.7. ^ Clark, Allen C. (1938). Daniel Carroll of Duddington (Vol. 39 ed.). Washington, DC. : Columbia Historical Society. p. 36. ^ Green, Constance McLaughlin (1962). "Phoenix on the Potomac, 1812–1817". Washington: A History of the Capital, 1800-1950. Princeton, NJ: Princeton University Press. pp. 64–65. JSTOR j.ctt1mf6xv4.6. ^ Burton, Harold H.; Waggaman, Thomas E. (1952). The Story of the Place: Where First and A Streets Formerly Met at What Is Now the Site of the Supreme Court Building. Washington, DC. : Historical Society of Washington. pp. 141–142. JSTOR 40067303. ^ Green, Constance McLaughlin (1962). "Phoenix on the Potomac, 1812–1817". Washington: A History of the Capital, 1800–1950. Princeton, NJ: Princeton University Press. p. 65. JSTOR j.ctt1mf6xv4.6. ^ Clark, Allen C. (1938). Daniel Carroll of Duddington (Vol. 39 ed.). Washington, DC. : Columbia Historical Society. p. 35. ^ Burton, Harold H.; Waggaman, Thomas E. (1952). The Story of the Place: Where First and A Streets Formerly Met at What Is Now the Site of the Supreme Court Building. Washington, DC. : Historical Society of Washington. p. 142. JSTOR 40067303. ^ a b Burton, Harold H.; Waggaman, Thomas E. (1952). The Story of the Place: Where First and A Streets Formerly Met at What Is Now the Site of the Supreme Court Building. Washington, DC. : Historical Society of Washington. p. 143. JSTOR 40067303. ^ Allen, William C. (2001). "Destruction and Restoration, 1814–1817". History of the United States Capitol: A Chronicle of Design, Construction, and Politics. Washington, DC: United States Government Publishing Office. p. 100. ^ United States Congress, Thirteenth Congress (February 13, 1815). Session III, Statue III, Ch. 41 (PDF). Washington, DC: United States Congress. p. 205. ^ a b Allen, William C. (2001). "Destruction and Restoration, 1814–1817". History of the United States Capitol: A Chronicle of Design, Construction, and Politics. Washington, DC: United States Government Publishing Office. p. 103. ^ Skeen, C. Edward (2003). "The Fourteenth Congress Begins". 1816: America Rising. University Press of Kentucky. p. 37. JSTOR j.ctt130jf4x.7. ^ Green, Constance McLaughlin (1962). "Phoenix on the Potomac, 1812–1817". Washington: A History of the Capital, 1800–1950. Princeton, NJ: Princeton University Press. p. 73. JSTOR j.ctt1mf6xv4.6. Cruikshank, Ernest (2006) . The Documentary History of the campaign upon the Niagara frontier. (Part 1-2). University of Calgary. Archived from the original on May 27, 2011. Retrieved May 11, 2009. Elting, John R. (1995). Amateurs to Arms! A Military History of the War of 1812. New York: Da Capo Press. p. 220. ISBN 0-306-80653-3. Fredriksen, John C. (2001). America's Military Adversaries: From Colonial Times to the Present. ABC-CLIO. p. 116. ISBN 978-1-57607-603-3. George, Christopher T (2000). 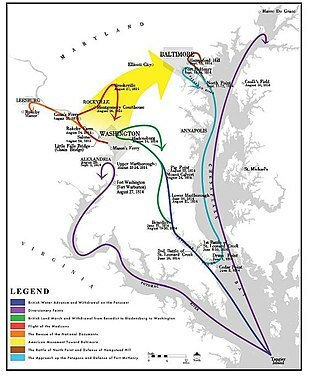 Terror on the Chesapeake: The War of 1812 on the Bay. White Mane Books. p. 111. ISBN 978-1-57249-276-9. Gerson, Leonard; Branam, Alfred (August 14, 1973). "National Register of Historic Places Inventory – Nomination Form". National Register of Historic Places. National Park Service. Retrieved April 29, 2016. Gleig, George Robert (1827). The Campaigns of the British Army at Washington and New Orleans, 1814–1815. London: J. Murray. ISBN 0-665-45385-X. Gura, David (August 24, 2009). "Descendants of a Slave See The Painting He Saved". The Two-Way. NPR. Retrieved August 24, 2010. Herrick, Carole (2005). August 24, 1814: Washington in Flames. Falls Church, VA: Higher Education Publications, Inc.
Hickey, Donald R. (1989). The War of 1812, A Forgotten Conflict. Chicago: University of Illinois Press, Chicago and Urbana. ISBN 0-252-01613-0. Hitsman, J. Mackay; Graves, Donald E. (1999). The Incredible War of 1812. Toronto: Robin Brass Studio. ISBN 1-896941-13-3. Jennings, Paul (1865). A Colored Man's Reminiscences of James Madison. Brookyn: George C. Beadle. Landry, Peter (2009). Settlement, Revolution & War. Bloomington, IL: Trafford Publishing. p. 255. ISBN 978-1-4251-8791-0. McCormick, John H. (1904). "The First Master of Ceremonies of the White House". Records of the Columbia Historical Society. Washington, D.C. 7: 170–194. Retrieved April 30, 2016. Morriss, Roger (1997). Cockburn and the British Navy in Transition: Admiral Sir George Cockburn, 1772–1853. University of Exeter Press. ISBN 978-1-57003-253-0. NWS staff (June 15, 2011). "NWS Sterling, VA – D.C. Tornado Events". National Weather Service Eastern Region Headquarters. Retrieved August 24, 2010. Myatt, Kevin (August 26, 2006). "Did tornado wreak havoc on War of 1812?". The Roanoke Times. Roanoke, VA. Archived from the original on September 8, 2012. Retrieved August 24, 2010. Roosevelt, Theodore (1902). The Naval War of 1812 or the History of the United States Navy during the Last War with Great Britain to Which Is Appended an Account of the Battle of New Orleans. Part II. New York and London: G. P. Putnam's Sons. Siegel, Robert; Block, Melissa (August 24, 2009). "Descendant Of White House Slave Shares Legacy". NPR. Retrieved August 24, 2010. Taylor, Nancy (August 14, 1973). "National Register of Historic Places Inventory – Nomination Form". National Register of Historic Places. National Park Service. Retrieved April 30, 2016. The Reports of Committees of the House of Representatives for the Second Session of the Fifty-Third Congress. Washington: Government Printing Office. 1894. Retrieved April 30, 2016. Willets, Gilson (1908). Inside History of the White House-the complete history of the domestic and official life in Washington of the nation's presidents and their families. New York: The Christian Herald. Siegel, Robert Descendant Of White House Slave Shares Legacy NPR, August 24, 2009.